Powered by custom made, high precision optics, Cinomorph lens by Prismasonic brings a real cinematic atmosphere in your own home theater the way the director intended. The lens produces a variable horizontal expand to the projected image from factors of 1.0 up to 1.35, thus supporting perfectly the constant height 2.40:1 Cinemascope setup. An internal ‘pass’ mode makes it possible to produce a normal wide screen picture with a 1.78:1 source material, without removing the lens. Also the other aspect ratios, such as 1.85:1 and 2.0:1 are possible due to this unique feature of a variable Prismasonic lens. This all means that despite of the aspect of a source material, your projector always presents a constant picture height with the full panel resolution, exactly as in real movie theaters. Also with the 2.4:1 aspect ratio produced by the lens, the picture has around 15% more luminance compared to the zoomed picture of same size and projected from the same throw distance. This is due to taking the unused pixels of black bars into the use with the aid of our anamorphic lens. The prisms of P-100 series have been finished by the optical glass using the highest possible specification parameters during the manufacturing process. In order to correct the chromatic aberration, the product has an achromatic optics, which means that the both lenses are made by two glass materials of different optical properties. All the air-glass surfaces have broad band anti-reflection coatings to prevent reflections and ghosting, and to maximize the light output of the projector. 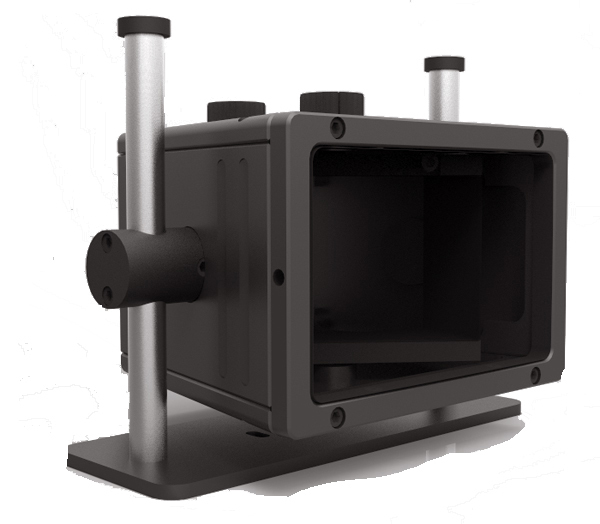 The additional optical Front Element corrects the focus of an anamorphic expand, simultaneously for all horizontal expand factors. The lens is available in black finished aluminum. A professional table stand has a friction based, individual controls for both height and tilt adjustments. Both shelf and ceiling mounting are conceivable. As a nice feature the housing has a removable bottom plate. Thus it is convenient to clean the optics from both sides. This manual controlled lens has two knobs on top to adjust the aspect ratio. The one control position expands the image to fill the 2.40:1 screen, while the other returns it back to 1.78:1. In addition to the instructive label printings there are adjustable terminal stops for both prisms and both modes, so the initial setup can easily be operated to match the different screens and projectors perfectly.